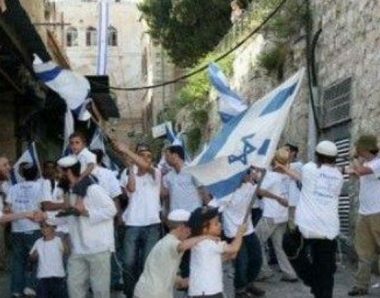 A group of extremist illegal Israeli colonists marched, Tuesday, in Tel Romedia Palestinian neighborhood, in the southern West Bank city of Hebron, heading to the Ibrahimi Mosque, and stormed a Palestinian home. Emad Jaber, a local nonviolent activist against Israel’s colonies, said Israeli soldiers closed the Ibrahimi Mosque, and prevented the Palestinians from entering it. He added that the soldiers also closed all entrances leading to the mosque, and the Palestinian neighborhoods on the Old City. The colonists then marched waving Israeli flags, and chanting racist slogans against the Palestinians. During their provocative march, several colonists invaded a Palestinian home near the illegal Abraham Avino colonialist outpost.